The UK's network infrastructure is fast arriving at "capacity crunch" point, according to research fom the University of Southampton. 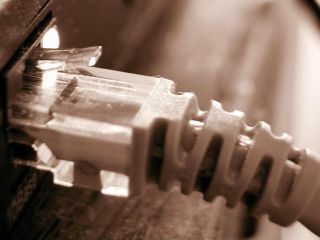 The argument over whether the UK's old communications network can cope with the rise and rise of broadband has become a fierce one, with the likes of Virgin Media telling TechRadar back in June that a broadband crisis was looming, and both BT and Sky insisting that this was incorrect. However, research from David Richardson at the University of Southampton which has been outlined in Science has underlined the obvious – that without radical investment, the current infrastructure (including fibre) will be overwhelmed. "The thought that the current fibre technology has infinite capacity is not true - we are beginning to hit the fundamental limits of the current technology," Richardson told BBC News. "We need to be looking at the next big breakthrough to allow us to continue to scale as we have traditionally done." "If you gain a factor of two in bandwidth by developing a whole new amplifier technology, that's perhaps two or three years of capacity growth. To get radical changes - to get factors of 100 or 1000 - it's going to be extremely demanding. "It's likely we're going to have to go right back to the fundamentals of the optics, the actual light pipes. And if you want to develop the next generation of cable, you want to be doing that 10 years in advance, not for tomorrow." Just last week, Sky's director of broadband and telephony Delia Bushel told TechRadar: "I think that the DSL network is quite capable of dealing with people's usage. It will remain so for a significant time." "They will experience it explicitly – where it crashes – or more likely they will just be getting a video experience as bad as it was a year or two years ago. BT's responding directly to TechRadar's interview with Jon James said that talk of a crunch was "silly." "DSL speeds are increasing all the time so it is silly to suggest that there is a crunch point coming," BT senior media relations manager Job Carter told TechRadar, although he went on to talk about the importance of investment in a fibre-optic infrastructure. That Britain's infrastructure needs an overhaul is something of a no-brainer, but having research to back it up at least lifts the problem out from the squabbling of our ISPs.